Just about everyone grew up playing Hasbro games. Now some of those old favorites make a new appearance in life-sized splendor in the new Hasbro The Game Show, one of the Funship 2.0 upgrades available when cruising on Carnival‘s newest ship, the Breeze. These games provide a few lucky people the opportunity to live the games they once played. 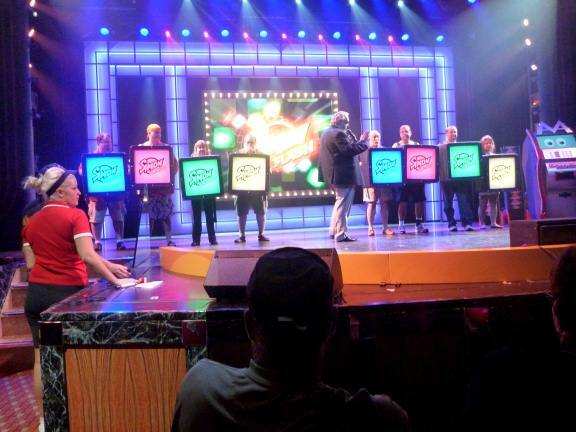 Our recent transatlantic voyage on Carnival Breeze included three episodes of Hasbro The Game Show. 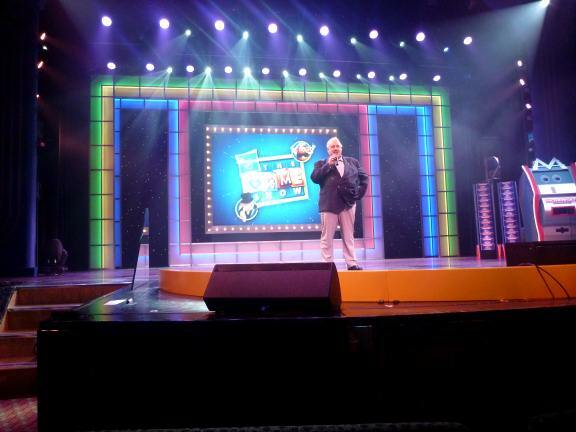 We entered the theater to find the stage transformed into a giant game show set. Anyone sitting in the lower level of the theater may get an opportunity to play, those seated in the balcony can merely observe. First things first, the host must choose some contestants. 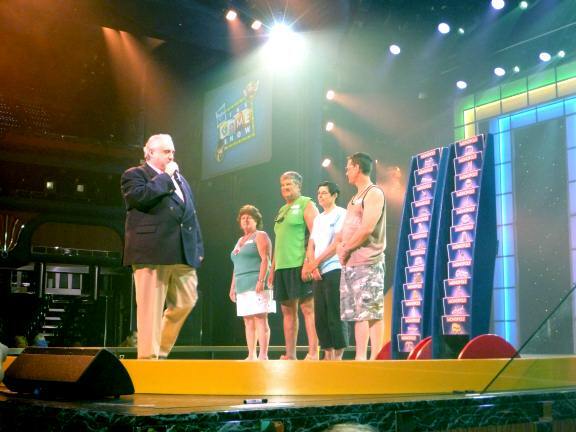 John Heald, the cruise director on our transatlantic voyage, hosted the show, announcing at the very start that it was his first time acting as a game show host. Special lighting effects divided the theater into blue and red sides, shining blue or red light on each half of the audience. From the side in the blue light, members of the blue team were chosen, from the red side the red team formed. John Heald asked questions alternately from one side to the other. Many people knew the answer. The key to getting chosen required getting his attention. On the first question a large women ran down the aisle, knocking him down where they both landed in a heap. Afraid of the consequences of not letting her play, she became a contestant, no answer required. On subsequent questions people found ways to attract his attention until he had four members on each team. Those people played the first game offered that show. 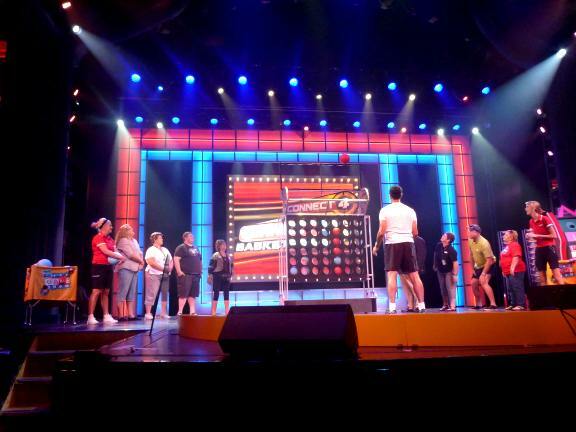 For the second game, a repeat of the contestant-choosing questions found eight new people. Neither of us played in the first show, but in the second episode my husband John got picked to answer a question by shining a light over himself. It did make him stand out in the audience of a relatively dark theater. They have a variety of games gone wild so each episode can have some different games. Simon Flash involves people wearing large colored cubes that light up in four different colors and the first team to arrange themselves in the correct order of which the lights flashed for them wins. They had several turns at it, each time the lights flashed faster and the team who lined up quickest the most times won. Connect 4 involved throwing a basketball into a giant connect 4 board. The object of course is to get four of your team’s color in a row, but of the teams we watched playing that game one of them struggled just to get a ball into the game board at all. The other team won easily. John played in Sorry Sliders, where each contestant got a chance to slide a very large sorry-style game piece onto a target area for varying amounts of points. His team won that game. The last game we saw, called Operation Sam Dunk, resembled a cross between operation and skee-ball. 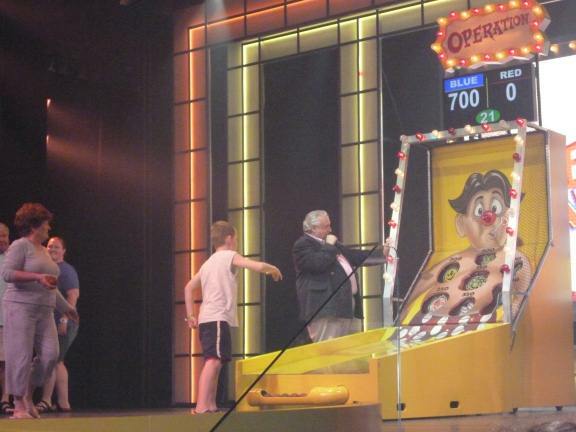 Sam, the unfortunate character from the operation game, now appears larger than life on an apparatus resembling a skee-ball table. Instead of the usual circular target areas this game has separate holes for a variety of body parts worth differing amounts of points. Given a time limit, each team rolled the ball one after the other as many times as they could in relay fashion before time’s up. The highest collective team score won. After playing their game, members of the winning team choose cards inspired by monopoly game pieces. The four from the first game sit in winner’s row, the front row next to the stage which has seats reserved just for them. 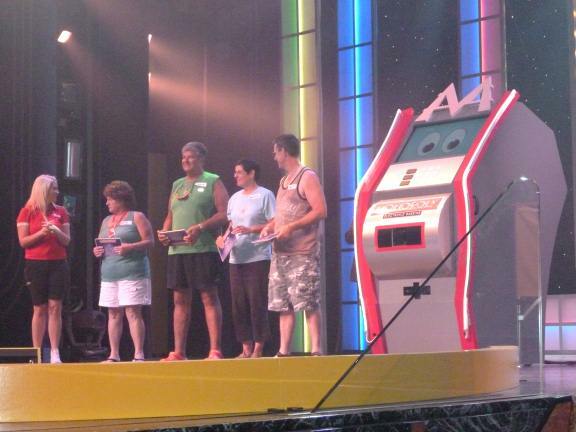 After the winners of the second game get their cards then all eight winning contestants insert their cards one by one into a giant monopoly cash machine and the card that registers the highest amount of monopoly money determines the winner. All players got prizes of some sort involving Hasbro games, the winner of the monopoly money of course receiving the largest prize. We missed the third episode, but had quite a lot of fun at the two we attended. I would definitely recommend this activity for anyone sailing on a Carnival ship that offers it. Our ship had this as an afternoon activity on several of the sea days. Being a transatlantic cruise we had a lot of sea days, which we love. 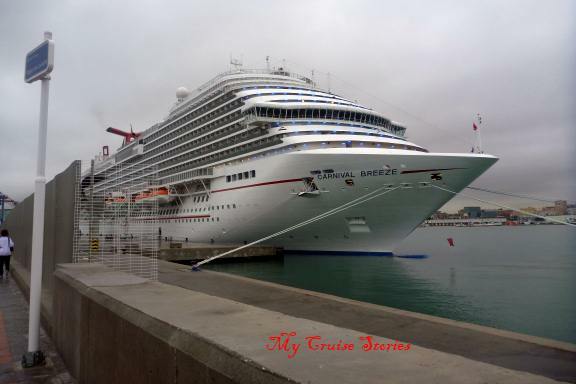 This entry was posted in Breeze, Carnival, Shipboard Life and tagged Carnival Breeze, cruise, funship 2.0, game show, giant game pieces, Hasbro The Game Show, photos, sea days. Bookmark the permalink. That sounds like fun. My wife and I play some board games. I think I’m more into it then she is though. That was the BIGGEST board game I’ve ever played! The Breeze was awesome. I have not been on a Cruise in a while because it’s a pound a day for me. You might check out some of my posts under the menu button “Caribbean”. 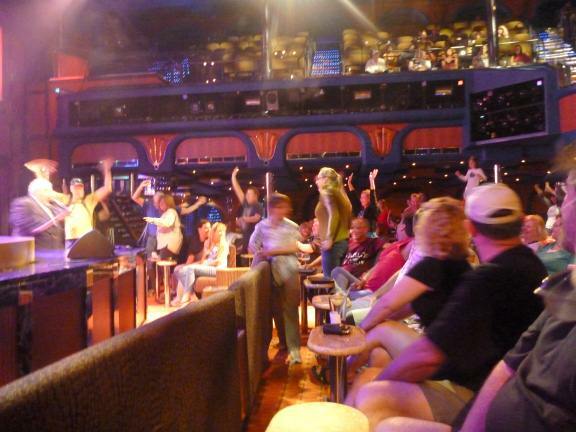 These are not from cruise trips, but I wound up hanging out with a lot of crew members at the No Name Bar in Cozumel. It is pretty hard not to gain weight on a cruise. One thing we do is avoid elevators because walking all those stairs works off a lot of calories. I’ll have to check out your posts. We had a really awesome snorkel excursion in Cozumel on our last cruise. I haven’t done a blog about it yet, but I do have a photo of a turtle on my facebook page. We saw the turtle first thing when we jumped in the water. Cozumel has great snorkeling and diving. I have over 100 dives off Cozumel. That’s a lot of dives. The reef we saw there was in better shape than a lot of the ones we’ve seen in the Caribbean. Hurricane Sandy must have missed that area. We saw damage from it in the Bahamas though. What did Dad get for his prize? I would LOVE to be in a game show. Preferably on TV, but on a cruise ship would be fun too. He got a card game version of a Hasbro game and a $20 gift card to the Hasbro online store. The one kid in the game got the main prize, so that worked out well.